During the summer, Colgate students are applying their liberal arts know-how in a variety of real-world settings, and they are keeping our community posted on their progress. Economics and international relations double major Heather Fredrick ’20, of Montrose, Colorado, shares her internship experience as a researcher for Colgate’s Living Writers course. 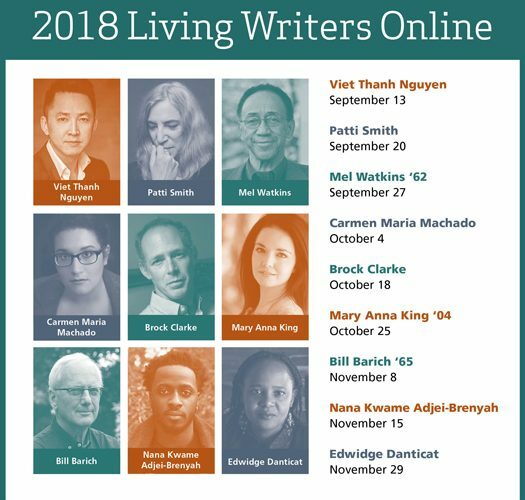 Living Writers includes a highly sought-after on-campus course; a weekly reading series in the fall; and an online, non-credit companion course to be taken by 800 alumni, parents, and community members. Gary detailed the unparalleled educational experience of reading contemporary fiction, examining the texts with Colgate faculty, and then having the authors of the texts come to campus to discuss their works and writing processes. Because I am double majoring in economics and international relations and trying to become fluent in Spanish, I am unsure if I will have the time in my schedule to take the course. This summer, however, I am delighted to be working at Colgate under the direction of Professor Jennifer Brice as a student researcher for Living Writers. As a Living Writers researcher, I get to read each of the nine books and discuss them in weekly meetings with Professor Brice and my fellow student researcher, Kim Ravold ’19. We analyze main themes, formulate potential discussion questions, and draw comparisons with other literature. Researchers are necessary for this program because the class is new in every iteration, so the work must begin afresh every summer. I conduct research at the library and online to assemble reviews, articles, biographies, and additional materials on each Living Writers text and author. I am in the process of making a Spotify playlist to accompany Patti Smith’s Just Kids. I also work with IT, communications, and alumni affairs to queue up social media alerts about the program for the fall and to promote the online companion course. Perhaps one of my greatest tasks is supplementing the Living Writers website with material about the authors and works. I often feel like I never have time to read for pleasure, but it has been refreshing to rediscover my passion for literature and experience summer at Colgate. The Living Writers texts range from satirical fictions to short story collections to memoirs that make me tear up, so I look forward to watching the Livestream author visits from London (where I will be spending the fall semester) and partaking in the online companion course.